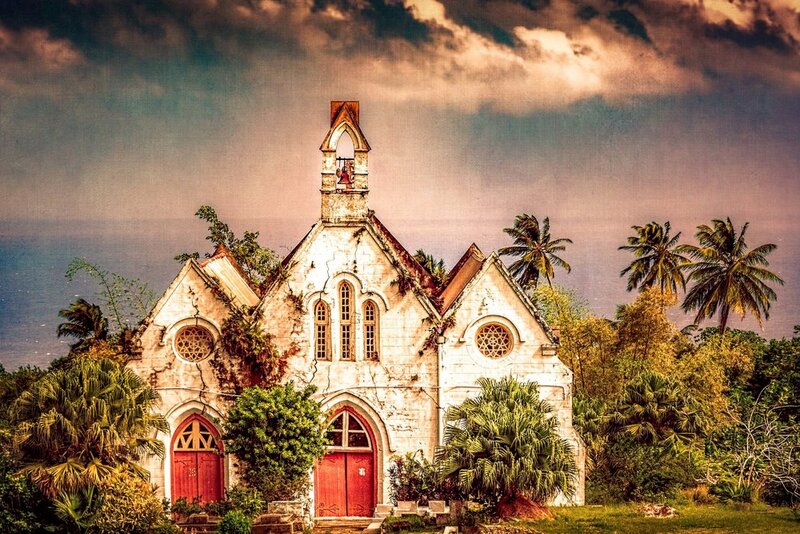 On the Island of Barbados, the beauty and character of Saint Joseph’s church is matched only by its amazing history. I was lucky to shoot from Hackleton’s Cliff above the church grounds on a magnificently sunny, but brutally windy day. Looking closely, you can see how slanted the building is with several enormous, crippling cracks across the front of the facade. The church faces the Eastern side of the island, with the intense blue haze of the Atlantic Ocean behind, and storms clouds threatening above. The initial church was built before 1641, damaged by a hurricane in 1789, mostly destroyed by another in 1831, partially rebuilt in 1839, structurally damaged by land slippage and earth tremors in 2007, and battered once again during Tropical Storm Thomas in October of 2010. Taken in December of 2013, this image might have been among some of the last since the 300-year old Anglican church was recently deconsecrated in preparation for demolition. Seeing the church bathed in sunlight from above, the beautiful Caribbean, and feeling the full intensity of the ocean, I am amazed by the history, character, and resilience of purpose of this old church that will soon be no more.